is one genre – heavy metal – that has garnered quite the following in the state. Going by the phenomenal response the annual Summer Shred concerts receive, one can say the audience is growing in numbers. But what makes Goa different is the presence of one of India’s leading and much sought after heavy metal bands on the national circuit – Within Ceres. For years, the group has mastered the art and whenever they play, be it in Goa or elsewhere in the country, the crowds go crazy. Unlike other concerts, the intensity and interaction between the band and the audience is at an extreme level. The screeching, the shredding, the head -banging, it’s an adrenalin rush! Within Ceres was formed in 2014 by Odin Desa, the guitarist and producer. The original intention was to create an all Goan metal super band and compete for ‘Searock’ - an all India rock competition. As time passed, many of the original band members had to part ways due to various career and family obligations, but the idea and the philosophy of the band has lived on and grown over the years, with people from the metro cities and also the Goan rock and roll crowd accepting and appreciating their music. The band now consists of Odin Desa (guitars/production), Arnold Carvalho (vocals), Kadesh Dsouza (guitars), Aaron Braganza (bass) and David Rebello (drums) and have performed at some of the country’s top venues like High Spirits (Pune), Antisocial (Khar - Mumbai), Indigo Live, Opus, Bflat (Bengaluru) and many more. “Watching the entire crowd headbang and form mosh pits makes us feel we’ve succeeded in reaching out to the crowd”, says Odin. 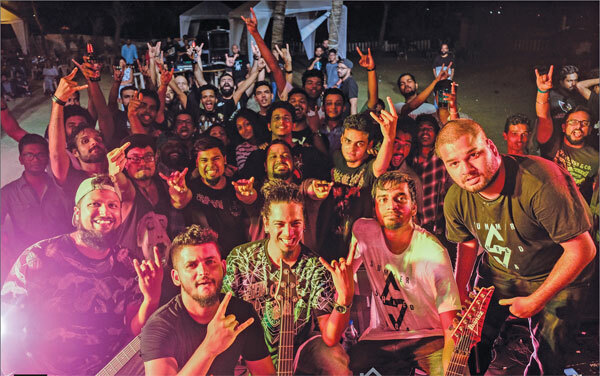 They have headlined some of Goa’s best rock festivals like, Summershred, Distort, Chase the Horizon apart from consistently playing for ‘Rock in Goa’. In June 2016, Within Ceres independently released their first single,‘State of Emergency’, which has been received very well by the metal community throughout the country and beyond. Later this year, sometime in September, they plan on releasing their first studio album, ‘Skyless’. To mark this, Within Ceres shot their first music video for the single ‘Our Oceans’, which is set to release worldwide today, June 30, 2018. The song is being released worldwide digitally along with the music video. The song will be released on all major stores and the music video for YouTube. There will also be screening for the first time at 1930 Vasco, today, to coincide with their worldwide release. The video has been shot at 1930 Vasco (Shopping Mall) and the lighting and sound set up was organised by Saviotronics.The music video has been produced by Sunset Catchers, a video production team from Goa, as an initiative to promote local artistEs. The video has been directed by Arvin Vaz, cinematography/edit and VFX by Jules Goes, with Aaryan Raane as Production Head and Prajwal Tari as Assistant Cinematographer. Odin is producing the album ‘Skyless’ with various contemporary sounds and hopes to set a new tone in metal music on the whole.“We are excited about reaching out to more people across the world with this music video. We hope the video will be watched by many. We want to reach out to new audiences and grow our fanbase in Goa as well as internationally,” says Odin. This year, they introduced their live visual set for ‘Skyless’, which again was programmed by Sunset Catchers. Speaking about their future plans, Odin added that they hope to tour the US and Europe in the near future, as they feel there is a large community of metal heads in those regions and they have been getting good responses to their music from people there. “We plan to perform songs from this album at some of the festivals in India this year to get people to headbang like they’ve never done before,” concludes Odin. "I've had a chance to see the band a few times over and they've always been going from strength to strength. I got to hear this track at their show as well as now in its polished studio form and you can tell they're working on a cohesive sound that is familiar yet fresh." "I heard Within Ceres live for the first time last year at The Goa Music Fest, which we organised at Tito's. I was really impressed with their sound, super production and great stage presence. Within Ceres is the band to look out for on the Indian Rock circuit and i see these boys going really far." "Creative insanity and there is no doubt that they are the heaviest band to come out of Goa. Hope they tour the globe soon. They have a great future."